Someone who donates $100 and receives all of it ($100) back in state tax cuts (i.e. tax credits) would receive no (zero) federal charitable deduction under the proposed regulation. They have done nothing truly charitable. 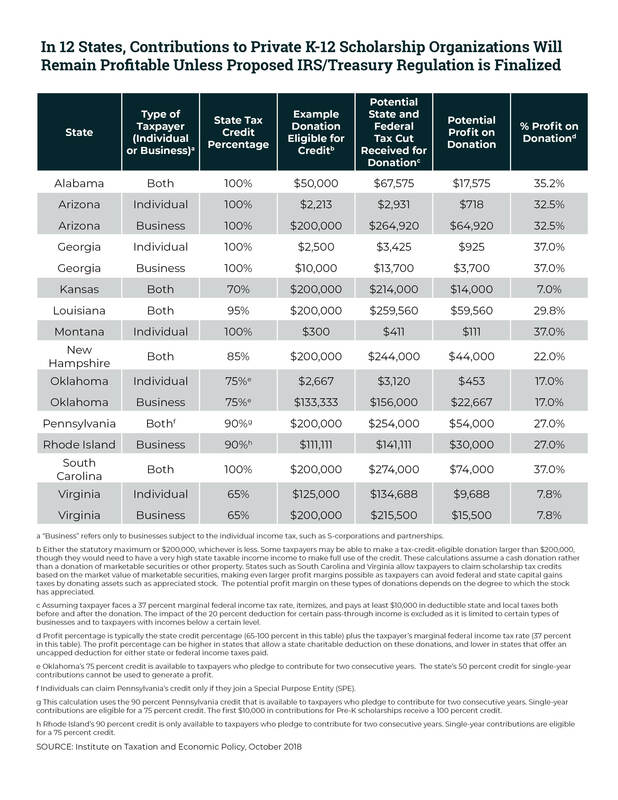 Someone who donates $100 and receives three-quarters ($75) back in state tax cuts (i.e. tax credits) would only be allowed to write-off the other one-quarter ($25) as a gift eligible for the federal charitable deduction. This type of reform is essential to ending a long-running tax shelter under which private school voucher donors receive lucrative state tax credits worth up to 100 percent of the amount they donate, and yet write-off those “donations” on their federal tax forms. The potential profits are even larger in some states, with Arizona, Louisiana, Pennsylvania, and South Carolina each facilitating especially large private school voucher tax shelters. Additional information on this issue is available here. Interested individuals and organizations can read the proposed regulation here and provide comments to the IRS here, through October 11.